Close Streams is duet originally choreographed and performed in 1983. It is a viscerally intense physical work in which the two performers run for a sustained period of time in circles. One of Agis's early works, Close Streams was performed extensively in 1983 throughout London venues (Riverside Studios, Drill Hall, Chisenhale Dance Space, the Place), at Dartington Dance Festival and in several venues in Belgium. This work also appeared in Channel 4's Monuments and Maidens programme. In 2016 the artist/curator David Ward invite Gaby Agis to reconstruct Close Streams for a series of performances as part of Turner Contemporary's summer show, Seeing Round Corners. In 2018 Close Streams was reconstructed alongside Shouting Out Loud for a performance in the LEAP Festival, Liverpool. The 2016 performances at Turner Contemporary were supported by The Bryan Robertson Trust. First performed by Gaby Agis in 1983, Close Streams is an intensely physical duet for two women, which explores a journey and a close bond. 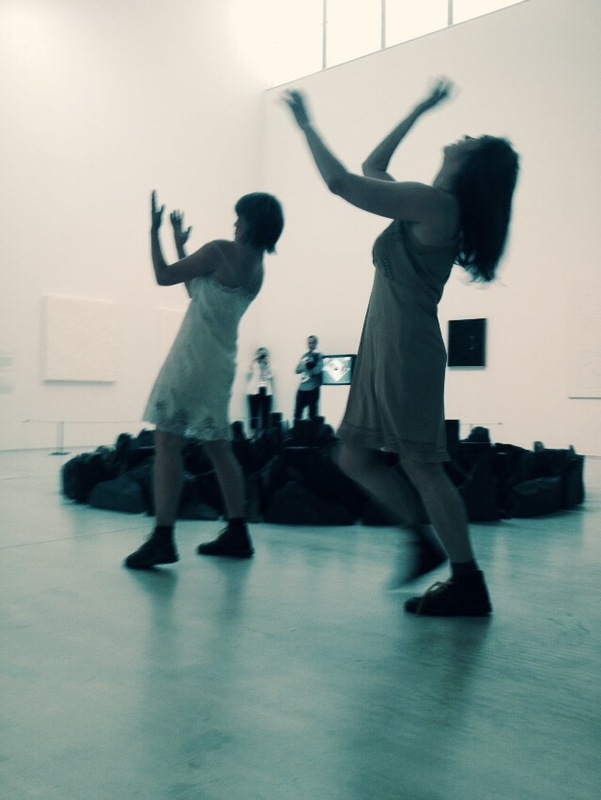 For this performance at the Turner Contemporary in Margate which opened, and will close the exhibition Seeing Round Corners: the Art of the Circle, Agis and Eeva Marie Mutka dance round Richard Long’s circular slate installation. The exhibition displays the work of an impressive range of artists, performers, photographers and sculptors who have used the circle to either influence their work or appear in it. Surrounding the performers on the walls of the gallery is a painting of overlapping yellow circles by Bridget Riley, Yellow Composition; Anish Kapoor’s sculpture Void, Ceal Floyer’s video Ink on Paper and other works by Mona Hatoum, JMW Turner and Rebecca Horn – to mention just a few. It’s a fascinatingly diverse, well-curated exhibition and worth the trip to Margate but somehow having live performance in a gallery of static paintings and objects both energises the space and resonates more acutely with the physical and spiritual properties of the circle. Revisiting a piece that you have created back in the past is an emotional and complex undertaking especially in the case of Close Streams, which was the first work that Agis made. She describes the challenges of recreating it: peeling back the layers of memory and association in the choreography, meeting the material again as an older woman with a changed body. Consequently she brings both enormous wisdom and vulnerability to the work. Agis and Mutka walk slowly side-by-side into the gallery before breaking into an urgent run keeping dangerously close to the periphery of Long’s concentration of craggy miniature rocks. Like athletes on a race course, the women have an unflinching focus as they work hard to keep abreast one another. Unadorned yet feminine in beige coloured satin slips and walking boots, they embody a curious mixture of decadent frippery and practical earthiness. It’s a strange choice of costume which combined with the determined sprinting, suggests sudden, hasty escape; women/refugees in flight and in a state of undress. The presence of the black rocks looming in their midst could be either an impenetrable mountain range or a forbidden spiritual site. They slow down, stop in stillness then tentatively reach out, touching the air around them, connecting to their inner core as they centre themselves. Heightened sensory awareness in their movement quality keeps their performance sincere and meditative. Next they connect, surfing over each other, falling, balancing. Mutka slides over Agis’s legs or perches on her back, Agis struggles under Mutka’s weight. Their toil and effort, as if they are covering difficult terrain, is punctuated by moments of exhausted calmness. Standing apart, they burst out in explosive stamping accompanied by non-verbal shouts of anger and release before gently easing into a sensuous embracing intimacy. As they hold each other they complete their circular journey in this private, enduring, mutually supportive relationship. Walking slowly out of the gallery, Agis and Mutka disappear leaving the power of their female presences, the vitality of their bodies hanging in the space. Their valuable, if ephemeral contribution to the exhibition remains with us.